On International Justice Day, July 17th, ICTJ looks at the legacy of the Special Court for Sierra Leone through the voices of those to whom its work was most important: the citizens of Sierra Leone. Our new multimedia project, “Seeds of Justice: Sierra Leone,” presents five portraits of Sierra Leoneans whose lives were impacted by this court. New York, NY - As the Special Court for Sierra Leone wraps up cases against accused war criminals, a conference will be held later this week in Freetown to assess the Court’s work and lasting legacy. The conference is part of a larger international effort to look at how the court has helped to bring peace and establish the rule of law for the people of Sierra Leone, Liberia, and the region as a whole. As part of our exploration into the legacy of the SCSL, we talk to Alison Smith, Director of the International Criminal Justice Program for No Peace Without Justice. In this conversation with Hannah Dunphy of ICTJ, she says that the SCSL should be remembered "for its vision," and talks about the release of a new report by NPWJ, "Making Justice Count: Assessing the Impact and Legacy of the Special Court for Sierra Leone." As our exploration of the story of the Special Court for Sierra Leone continues, we talk with the United States Ambassador-at-Large for Global Criminal Justice, Stephen J. Rapp. In this interview with Hannah Dunphy, Ambassador Rapp looks back on some of the most memorable moments during his tenure as prosecutor for the Special Court, including the experience of the trial of former Liberian President Charles Taylor. Our latest episode of ICTJ's podcast series on the legacy of the Special Court for Sierra Leone offers perspectives from the Principal Defender of the SCSL, Fatmata Claire Carlton-Hanciles. In this conversation with ICTJ, Mrs. Carlton-Hanciles reflects on the challenges of setting up the SCSL, the accomplishments it has achieved, and why a strong defense was critical to the Court's legitimacy. In the first of ICTJ's podcast series on the legacy of the Special Court for Sierra Leone, we sit down with Ambassador Allieu Ibrahim Kanu, the former Deputy Permanent Representative for Legal Affairs at the Mission of Sierra Leone to the United Nations. In this discussion with ICTJ's Hannah Dunphy, he reflects on the evolution of the SCSL and shares his perspectives on its legacy. While the legacy of the SCSL is a story that is still unfolding, ICTJ is pleased to help facilitate a sustained, international effort to critically assess the lessons to be learned from this groundbreaking institution. On November 7-8, 2012, ICTJ hosted a conference in New York to initiate this process. The forum coincided with the launch of ICTJ’s multimedia project, “Exploring the Legacy of the Special Court for Sierra Leone,” a site created to support the New York conference, as well as the Freetown conference in January 2013. Overall, the Special Court for Sierra Leone remains one of the most important attempts to reshape international justice. There are many valuable lessons to be learned from its experiences, of direct relevance for future efforts. More immediately for those who it was set up to serve, however, if the Special Court is to achieve its full potential, it deserves the international community’s political and financial support in the last phase of its operations and in ensuring its continuing legacy. Introducing the multimedia project "Exploring the Legacy of the Special Court for Sierra Leone"
The SCSL is expected to close its doors towards the latter half of 2013. The ICTJ wanted to take this opportunity to look more closely at the court's work and reflect on its legacy – not only for Sierra Leoneans but also for the international community. What lessons can we extract from the court’s more than 10 years of existence? How will its work extend beyond the court itself? What has been its impact on the lives of Sierra Leoneans and the future of the country? To contribute to answering these questions, ICTJ has launched a special multimedia project, Exploring the Legacy of the Special Court for Sierra Leone. 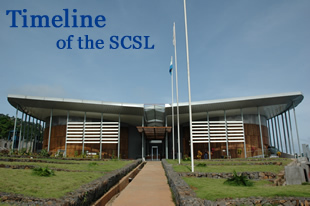 This website, established to support two conferences that will take place, one in New York on November 7-8, 2012, and one in Freetown on January 9-10, 2013, will be regularly updated during this time period, providing information on the history of the court and its legacy in different formats. Read more about Introducing the multimedia project "Exploring the Legacy of the Special Court for Sierra Leone"